MINNEAPOLIS — Minnesota coach P.J. Fleck spent all offseason and the first two weeks of the season waiting for one of his two quarterbacks to take charge, show some leadership and win the starting job. Conor Rhoda took a big step forward with a poised and efficient performance in a convincing win over Oregon State last weekend. And Demry Croft may have put the uncertainty to rest completely with his conduct off the field. 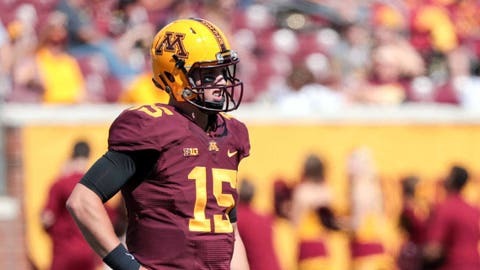 Fleck named Rhoda the full-time starter on Tuesday, the same day he announced Croft would not be with the team on Saturday against Middle Tennessee State because of disciplinary reasons. Fleck declined to say specifically what Croft had done to merit the discipline, but the first-year Golden Gophers coach did not mince words when expressing his disappointment in Croft’s actions. Rhoda was one week away from starting the job hunt for a position in medical sales when Fleck was hired to replace Tracy Claeys. Fleck called Rhoda the morning after his hiring and convinced the quarterback to return for his fifth year and compete with Croft for the job. Rhoda and Croft did little to distinguish themselves during spring practice or fall camp, so Fleck decided to platoon them at the start of the season. They shared the duties during wins over Buffalo and Oregon State, a game in which Rhoda completed 7 of 8 passes for 158 yards and a touchdown. Croft did not play for much of the second half against the Beavers after losing a fumble in the first half. He entered late in the 48-14 blowout and rushed for a 64-yard touchdown late in the game, but Fleck pulled the plug on him three days later. Croft has not been dismissed from the team, but it remains unclear just how long he will be away. Seth Green will be Rhoda’s backup on Saturday with Croft away. Fleck made it clear that Rhoda won the job more than Croft lost it, saying he was pleased with the senior’s steady leadership and ability to bounce back from mistakes.